After years of rather underserved neglect, in the past year model companies have turned to the Praga TNHP-S series tanks and their German derivatives with a vengeance. Last year Tristar released two kits of the Pzkw. 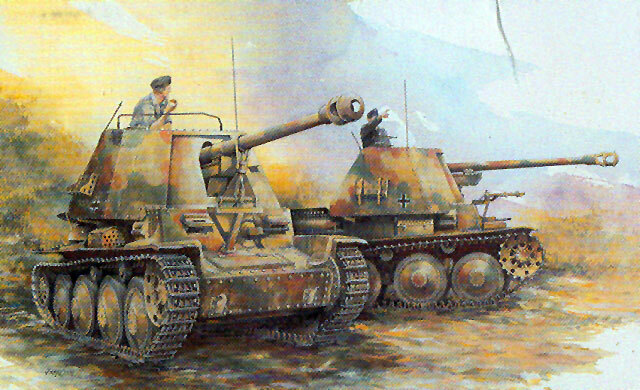 38(T) Ausf E/F and Ausf. G, and this year they are following it with a Marder III conversion. DML is also putting its hat into the ring with a series of Pzkw. 38(t) kits, and this one, the Marder III, is their first entry. There has been a lot of speculation on the internet about this kit, and having finally seen it, most of it turns out to be specious. Only one problem brought up by the "boo birds" seems to be correct: the base Pzkw. 38(t) chassis had a "kink" in the fenders about halfway along their length with the front section angling up about 3 degrees from the rear section. The fenders on this kit are dead straight, so it does not replicate that feature. However, many checks of photos with a straight edge show most of the vehicles in service either are hard to tell if this feature is present, or the fenders are so bend up along their edges that it is impossible to tell if it is kinked or not. While the kit comes with styrene fenders, a set of cyber-hobby.com etched brass ones now seems inevitable. "basket" at the rear of the deck extending out from the fighting compartment (which is nicely pre-formed and packed separately.) Others include the frame for the radio set and the ammunition rack mounts. Generally the kit follows the same formula as the Sd.Kfz. 251/22, the Sd.Kfz. 234/4 and Marder II kits in that it is a base vehicle with additional parts and two sprues from DML's towed Pak 40 kit. The directions are typical DML and start out being obtuse. For example, it shows the ammo cases being assembled and sealed with the rounds INSIDE the cases – only a small wording of "open/close" and some two-way arrows indicate it can be shown either way, with no drawing of what "open" is. The suspension is similar to that of the Tristar kits with each bogie assembly consisting of nine parts. A "doormat" type matting is provided for the floor of the fighting compartment. The rear plate comes with optional covers (D29) over the track tensioning mounts (D28) but in this case, unlike Tristar's first kits, it shows them as either/or rather than both at the same time. The driveline and interior are mostly styrene parts, such as the transmission/clutch assembly, steering controls, driveshaft and shield. DML's machine gun is similar to the Tristar one, but is not moveable once installed. It consists of a single piece element with a "slide molded" hollow flash hider. It comes with a mesh grille (MA-20) with working cover (MA-1, MA-12) over the rear air exhaust grille. The ammo racks are all molded as groups of tubes and dummy half rounds are provided to simulate a loaded tube. There is one small radio and it mounts on the right side of the casemate. Each periscope in the fighting compartment is all stryene (clear prism component, grey mounts) and may be positioned as folded or erected. Overall, this is a nice kit and a vast improvement over the 30+ year old Italeri one. It appears to be well laid out and with the (relatively) minimal amount of brass easy to assemble.